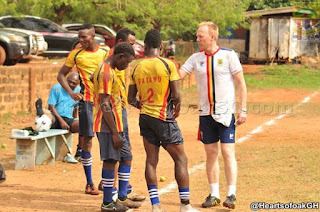 Former Coach of Hearts of Oak, Frank Elliot Nuttal has been touted as a candidate for the vacant Kumasi Asante coaching job after the resignation of Paa Kwesi Fabin. The Scot who has served as a fitness coach for Rangers and Middlesbrough until February 2018 was the Head Coach of rivals Accra Hearts of Oak. After a suspension, the club agreed to part ways with the gaffer for influencing top players to leave the club on a free. The Scot gaffer, currently clubless, believes that Kotoko is one of the glamourous clubs in Africa. That said, he will be available when given the nod to lead the club's technical front. Frank joined Hearts of Oak in 2017 where he led them to a 3rd place finish on the league log as well as a runner up berth in the FA Cup. Speaking to Volta Region based Agboo FM, Frank declared that, "Asante Kotoko is a one of the biggest clubs in Africa, with fabulous fans,and I am an experienced and successful UEFA Pro Licence Coach that is available to work." Kotoko can rely on his knowledge of the African game since he has served as a manager of Gor Mahia in Kenya. He led the Kenyan outfit to two league titles, going unbeaten in the 2014/15 season. In the same season he set a record by winning the league with the most accumulated points, 78. He spent 16 months in Kenya before joining Hearts of Oak upon the recommendation of former Kotoko Coach, Lugarasic. Names of renowned coaches like Bashir Hayford, Yusif Abubakar, C.K Akonnor and Vicenzo Alberto are all thought to be vying for the position but Elliot believes he is capable of leading the Royal Reds to the top echelon of world football. In his short stint with the Rainbow boys, he developed a side full of confidence and a delight to watch when in attacking positions. His high pressing football will better suit this young Kotoko side. Increasingly, the rumour mill looks to have settled on former XI Wise , Hearts of Oak, Dreams FC and Ashantigold manager, C.K Akonnor as the most likely suitor to the vacant position. Will Nuttal be considered for the hot seat?